You’ve got your entry form, you’ve got your passport, you’ve got your tool box, you’ve got your banger and fingers crossed it’ll still be running at the end of the rally! But are you correctly insured? This year the Motoscape Rally has teamed up with specialist motor insurer HIC (Herts Insurance Consultants) to offer a banger rally insurance scheme that will cover you both effectively and for a reasonable price. It’ll mean no nasty surprises along the way, plus it’ll save you time when you check in at the start line. We know this specialist insurance gives you the correct level of cover you need to partake safely and legally in the rally. AREN’T I INSURED ALREADY THOUGH? This is up to you to check! Some insurers won’t cover you when you tell them you’re entering a charity rally, especially ones that include travel to overseas countries, however remember this is not a race, it is a European motor tour. Check with your own insurance and then with HIC and judge for yourself on the best option. WHAT ABOUT BY MY CO-DRIVERS? WILL THEY BE COVERED? The specialist cover HIC provide allows cover for up to four drivers, subject to circumstances and age of course, so you’ll have the peace of mind that everyone is covered fully and legitimately while driving but please bear in mind the cover is third party only. This is up to you! The HIC policy can be tailored to suit your requirements. It might also be worth checking with your own insurance to see if they allow additional vehicles to be added to your policy on a short-term basis. HOW DO I GET MY POLICY WITH HIC? ARE THERE OTHER WAYS TO INSURE MY BANGER? 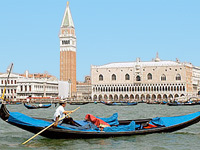 You should be able to take out a standard car insurance policy with added European cover. Remember, this is a motoring tour, it is not a race / speed rally, so do not mention anything to do with speed, rally and races as most insurance companies do not cover this. Some people swap the insurance over from their own cars (not recommended if it means leaving an expensive car without theft cover); others take out a separate policy on a pay monthly basis and then cancel it when they get back home (check the terms and conditions that the policy can be cancelled within a set period). This way it will cost you just one month’s insurance. The Motoscape Team are always on hand to give you advice on insurance for your banger, so don’t hesitate to give us a call, send an email, leave a comment below this blog or on Facebook and we’ll get back to you! 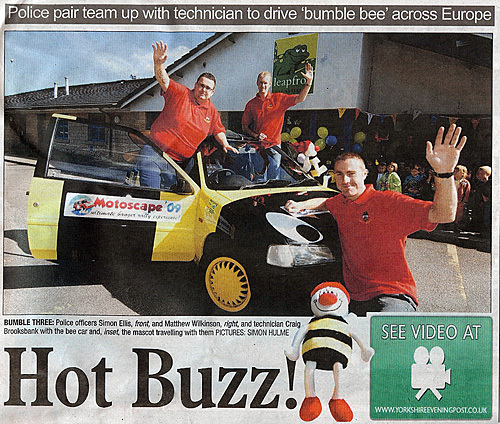 Earlier in September, one of the teams from the Krakow Rally, “Busy Bee’s” were featured in the Yorkshire Evening Post, prior to their trip on the Motoscape Rally! Here’s an excerpt from the interview, but you can read and listen to the full interview on the Yorkshire Evening Post wesbite here. THREE motorists who are gearing up to nail seven countries in seven days is an ambitious mission in itself. Even more so when it’s in a clapped-out old Peugot 106 worth £50 which has been resprayed to resemble a bumble bee. West Yorkshire bobbies Simon Ellis, 36, and Matthew Wilkinson, 28, have taken on the challenge along with vehicle technician Craig Brooksbank, 23. The trio will be buzzing across Europe in a bid to raise funds for the Cystic Fibrosis Trust after joining forces with a Guiseley nursery. If you’re taking part in one of our banger rallies next year to raise money for charity and are looking for a way to raise awareness about what you are doing, as the Busy Bee’s have proved, getting in touch with your local paper is a great way to let people know! We recently held a competition to win a free place on one of next years rally through twitter. For anyone who missed it, to enter the competition you simply had to become a follower of Motoscape on Twitter (check out our twitter page) and you were entered in the comp. Well we now have a winner Tom Jupp (@tom_Jupp). Congratulations Tom. 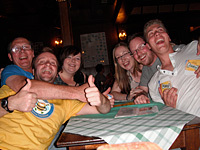 Tom’s team for next year is call “The Indicators” and they’ll be joining us on the Push on the Prague Rally. If your not yet following us on twitter, then why not? 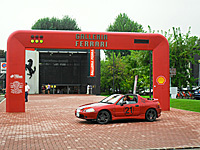 Simply sign up and click follow when you’re on our twitter page – http://twitter.com/BangerRally. Then you’ll have instant access to our latest news, updates and competitions as they happen! Well here we are, with the 2009 rallies over and having been a great success, we are now planning for next year. Thanks to everyone who came on the 2009 rallies as well. 1. We will be giving away cash prizes everyday for the winner of the daily challenge. 2. 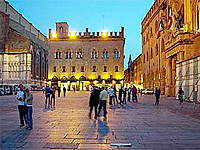 We’ll be introducing more places to visit along the way, as well as some old favourites including Hockenheim – home of the German Grand Prix, Maranello museum – the home of ferrari, the Stelvio Pass – known as the worlds best driving road as seen on top gear and Prauge – got to be one of the best cities in Europe (in our opinion), we are sure no one will be disappointed. 3. Prize for the best banger design. It’s great for us to see people put effort into their banger design, so make sure you go all out for next year! So any questions about next years rally just get in touch. Registration is now open and it’s been the busiest we’ve ever been with early interest, so make sure you get your name down to avoid dissapointment.